Thai language is the history of their religion believing all the elements in nature are governed by supernatural beings called "phii" and "jao". The two terms were used interchangeably, which might suggest the different aspects of the supernatural beings in nature. "Jao" implies a control over natural phenomena while "phii" implies the human quality of these supernatural beings. "Jao" needs to be paid respect or homage to. "Phii"; however has a close relationship with humans. "Phii" can be offended or pleased by what people do. In the old days, a wrong doing was described as an offense against the supernatural beings, "phit phii". Success in one's attempt to do something or an unanticipated good fortune were considered a consequence of "wai dii plee thook". Animism is not an active component in the Thais' religious belief nowadays and the term "phii" comes to mean ghosts or bad spirits. When the terms such as "phii baan" (lit., house "phii") or "phii paa" (lit., forest "phii") are used, people know that reference is being made to the time gone by or a certain practice in a remote village. The place of "phii" was taken over by "thep" and "phra". These two terms are new religious concepts from Hindu or Brahman mythology and literature. The supernatural beings in Hinduism are organized in a well structured hierarchy of cosmology. 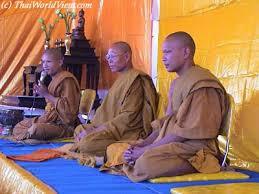 The supernatural beings residing in nature are promoted and become "thep" with the title "phra" for their names. Both "thep" and "phra" are derivatives of loanwords from Sanskrit. "Phii baan" is replaced by "phra phoom", the shrine for which is still found in the compound of many houses and business establishments. Other "phii" are replaced by various "thewada" or gods and goddesses. The belief in gods and goddesses provides a different explanation for the ups and downs in life. The word "chata" and "phromlikhit" are used, which imply fatalism and predestination. A person's life is pre-programmed by "phrom" or Lord Brahman in Hinduism. The ups are considered "choke" or good fortune. The downs are "khroe" or bad fortune. Both imply man's inability to manage his own life independently. As a consequence, a profession develops and becomes an important institution in Thai society. This is fortune telling. Consulting a psychiatrist is a stigma but visiting a fortune teller is considered normal if not wise by many Thais. The Thai word for a fortune teller is "maw doo" or a doctor who can see one's fate and fortune. Imported also from India shortly after Hinduism was Buddhism. With an explanation that Lord Buddha is a reincarnation of one of the Three Holy Lords in Hinduism, an usual and peaceful co-existence between the two faiths resulted in India and transported to Thailand also. According to Buddhism, there is also predestination. A person's life is predestined not by the Lord Brahman but by his own "karma" or deed in the previous life. However, life is not all predestination because it is also subject to the "karma" that a person performs in his life. There are two types of "karma": the good karma or "bun" and the bad "karma" or "baap". "Bun" can guarantee a happy and satisfactory life now and also in the next reincarnation. In many Thai people's thinking, "bun" is equated with a wealth or an asset. It can be earned and accumulated like money in a bank account. "Bun" is credit and "baap" is debit. 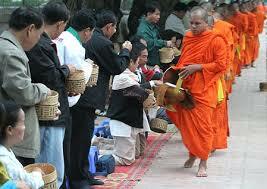 This perhaps explains a practice among Buddhists called "tham bun", which means the making of good merit or "bun". 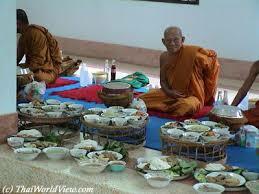 A person can "thambun" by offering food to monks, making a donation of money for the use of a temple, setting free caged birds, giving to the poor or by meditating and reciting Buddhists chants. For many, "bun" and "baap" can cancel one other. The three faiths still function in Thai society as evidenced in an opening of a new business company. With all his capital ready, an investor first consults a fortune teller about the prospect of his new venture. If the response is positive, he will ask for advice on the site which would be guarded by a benevolent protector "thep". The opening ceremony will be scheduled on the most auspicious day by his fortune teller, who may not share the same specialization as the one he consulted earlier. Part of the opening ceremony will be the officiating of the spirit house by Brahmins, who still live in a small community in Thailand. Another part will be a chant by nine Buddhist monks. Nine is an auspicious number, since in Thai the word for number nine is homophonous with the word for progress. Part of the food may later be given to children in an orphanage. The investor can now feel confident that he will have a successful business with all the auspicious calculation provided to him by his fortune tellers and the merit or "bun" he makes.